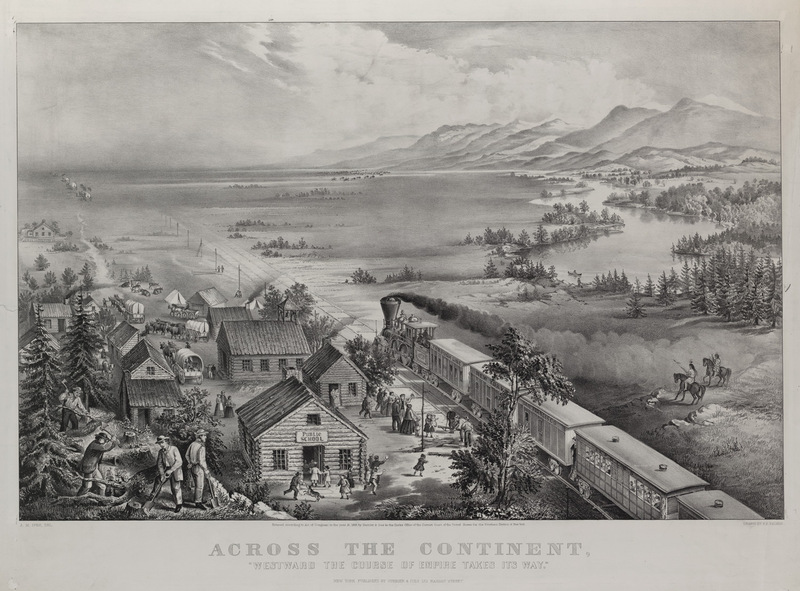 “Across the Continent” is among the most familiar lithographs of Currier and Ives. 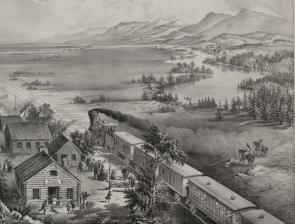 It features a locomotive chugging from the foreground toward a far western horizon. To the left of the tracks are the standard images of the coming of civilization—a schoolhouse with romping children outside, a church, covered wagons, cabins and sturdy yeomen felling trees. To the right of the tracks we see the wild country that other pioneers will soon transform. There are looming mountains, a winding river and rolling grasslands. Only two human figures are there. Two Indians sit astride their horses, watching the progress of the great machine. Black smoke belching from the train’s stack widens and spreads as it drifts back toward the pair. In a moment it will cover them. As usual with such prints, the symbolism of the images could hardly be clearer. A new order has arrived. It will make over the land. It will implant the essentials of a superior culture. And in the process the previous occupants, America’s Indian peoples, will be passed by, literally and figuratively. They, or at least their way of life, will be first obscured and then will vanish. To contemporary eyes “Across the Continent” seems, for its time (1868), typically oblivious to the human and cultural destruction that came with westward expansion, but it conveys a certain historical truth as well. The railroad, the centerpiece of the print, had few if any rivals as an instrument of western settlement, and in the conquest of the region’s dozens of Indian tribes, its role is difficult to overstate. The locomotive’s enveloping smoke is true enough as a metaphor for what railroads meant for Indian America in the years after the Civil War. It was partly a matter of timing. Railroads, as a technological marvel, appeared and spread just as the nation was acquiring and establishing its control over the far West and its native peoples. The first rail lines began operating in the 1830s, but they truly began to come into their own early in the next decade. The amount of trackage in 1840, fewer than three thousand miles, increased ten times over in the next twenty years, then leapt to more than 115,000 miles in 1880. Those same years saw the acquisition of the far West, its political organization, the start of its economic transformation—and the conquest and dispossession of its native peoples. The two developments—westward expansion and the establishment of a national rail system—cannot be understood apart from one another. The consequences for American Indians were especially doleful. Railroads began to undercut native independence before a single mile of track had been laid. Especially with the discovery of gold in California, the federal government felt a powerful need to bridge the distances between the bulk of the nation’s people east of the Missouri River and the rising populations on the Pacific Coast. During the 1850s the army surveyed and improved more than twenty thousand miles of roads in the West, but the greatest hopes were pinned on a transcontinental railroad. Four possible routes were surveyed, each with its eastern advocates who hoped to benefit from the traffic. To be considered, however, a route would have to be part of a territory or state and would have to have clear, unopposed access to the land where the rails would run. That meant settling up with American Indian tribes and eliminating any of their claims to the country in question. The result was a quarter century of vigorous efforts by railroad interests and their political allies to move Indians out of the way, part of the broader effort to confine and isolate them on reservations. It began in the 1850s. The Kansas-Nebraska Act (1854), the same law that raised the explosive issue of the expansion of slavery and in effect lit the fuse that led to the Civil War, also began the process of dispossession of Kansas Indians through a series of new treaties meant to open a rail route along the Great Overland Trail and to open Kansas to settlement. The Shawnees, for instance, having been removed from their native Ohio to eastern Kansas, now surrendered 1.4 million acres of land for less than sixty cents per acre. A similar scenario unfolded in the Pacific Northwest. The governor of the new Washington Territory, Isaac Stevens, had led the survey of the northernmost route meant to link St. Paul, Minnesota, to Puget Sound. Now, with ambitions to win the prize of the rail connection, he bullied through a series of treaties in 1855 to clear a way for a transcontinental and to open millions of acres to settlers. Discontent with the treaties then brought a series of wars that broke the power of some of the most prosperous and powerful tribes of the region. Railroads had more obvious calamitous effects on western Indians. By tapping into the interior, the railroads brought settlement to vast sections of the West that would likely have remained far less affected without them. With a rail connection a farmer in a Montana river valley could send his crops to market, a rancher in Arizona his cattle toward a slaughterhouse. What had been a long and dangerous journey for a family heading west now was considerably easier and safer. Railroads encouraged immigration more directly. All but one transcontinental line had been financed through massive grants of public lands meant to be sold to help pay for construction. To unload these lands, railroads hired hundreds of promoters across the East and Europe, offered cheap fares, and even provided temporary housing for any who could come. Rail connections to the Great Plains proved especially devastating. After acquiring horses, Indians there had become heavily dependent on the plains bison for food, shelter, clothing, trade, and much more. In 1872 it was found that bison hides could be processed into commercial leather, and white hide-hunters immediately set out to meet that demand. Within a decade they had driven the millions of animals to the verge of extinction. The slaughter would have been unlikely, probably impossible, had railroads not provided the means to ship the hides and bones off to eastern factories. In one year near the end of the carnage, 1881–1882, the Northern Pacific shipped 2,250 tons of hides from the northern plains. Once the herds were gone, plains Indians had no true option but to turn to reservations and dependence on federal support. In effect the life blood of a people had bled away through the rail lines. More obvious still was the role of the railroad in military conquest. Through the expanding steel network military leaders could focus the army’s great advantages in numbers and technology where needed, and could do so with remarkable speed. In June 1877 fighting broke out between the Nez Perce Indians and US troops in central Idaho. Distant commanders ordered ten companies of the 2nd Infantry into the field—from Georgia. Traveling by rail and steamboat, they were there in only sixteen days. Similar stories unfolded from the northern plains to the desert Southwest. Interestingly, Indian efforts to block or retard railroads were extremely rare. Warriors occasionally harassed surveyors, and in the summer of 1867 a party of Cheyennes on impulse derailed a train in Nebraska, killed several trainmen, and rode off with some plunder. Sending the locomotive off its tracks had been remarkably easy, yet there is no record of other such attacks. The advance of this great transforming force happened virtually unimpeded by those who had the most reason to resist it. Resistance in any case would surely have failed. Several forces converged after 1850 to overwhelm western Indian peoples with appalling speed and thoroughness. Breaking native power and independence east of the Mississippi River had taken about two centuries after the first colonial settlements. Doing so west of the Mississippi took barely thirty years. Among those several forces, the revolution in movement brought by railroads must rank among the most significant. They speeded the loss of native homelands, channeled in tens of thousands of settlers, triggered devastating blows to Indian economies and allowed the military to flex its muscles against any who fought back. United States, House, Report of the Secretary of the Interior, 1869, 41st Cong., 2nd sess., House Executive Document 1, Pt. 3, Serial 1414. Report of Gen. William Tecumseh Sherman, in Report of the Secretary of War, 1883, 48th Cong., 1st sess., House Executive Document 1, Pt. 2, Serial 2182. Elliott West is Alumni Distinguished Professor of History at the University of Arkansas. He is author of, among other books, The Contested Plains: Indians, Goldseekers, and the Rush to Colorado (1998), The Way to the West: Essays on the Central Plains (1995), and, most recently, The Last Indian War: The Nez Perce Story (2009).